You've seen this movie before, but now there's a snowplow in it. Liam Neeson, the star of seemingly every revenge-based action thriller released in the past 10 years, is at it again. And this time, he's in Colorado driving a snowplow. That's the real premise of Neeson's new movie Cold Pursuit, previously titled Hard Powder. 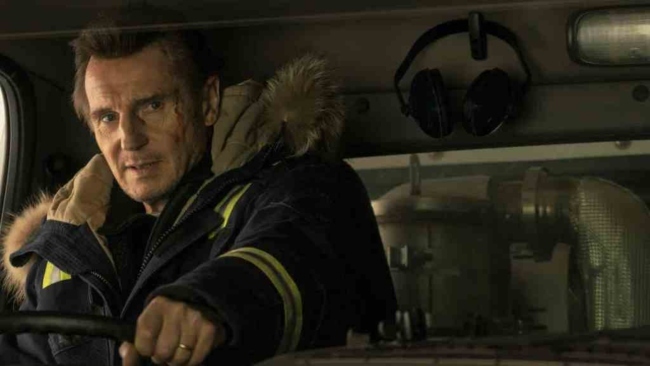 The plot: Liam Neeson is an unassuming snowplow driver in the fictional town of Kehoe, Colorado, whose world is turned upside down when his son dies of a heroin overdose. Except it wasn't a drug overdose. Neeson's son was actually murdered by a local criminal element nicknamed "Viking." So, Neeson swears vengeance on Viking and his, uh, clan, and hunts them down one by one via snowplow-based assassinations. "Don't Fear the Reaper" was a good music choice and I'm glad they didn't use a moody cover of it, like they do with every other song in a movie trailer. I would also like to register my objection to the scenes in which Neeson is seen snowplowing snow that appears to be between five to 10 feet deep. There is nowhere in Colorado, to my knowledge, where that happens. If a road gets that much snow, it's just closed until it melts because it's so far away from civilization that it doesn't matter. The film is scheduled to hit theatres February 8. What do you think? Share your thoughts in the comments below. Did you hear about the snowcat that was stolen out of a parking lot?